The International Monetary Fund has agreed to provide $12.5bn over the next three years to help Argentina out of its economic crisis. The new financial assistance package was approved at the IMF's annual meeting in Dubai. 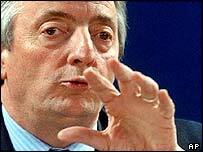 The IMF has already provided Argentina with substantial loans. There have been repeated arguments about whether the government has been implementing all of its reform pledges, the BBC economics correspondent Andrew Walker says. However, the executive board, made up of member countries of the IMF, appears to have been persuaded that the new programme could be made to work, he says. Creditors and the Argentine Government are preparing for talks early next week on rescheduling $90bn in defaulted government debt. Argentines are hoping to see some sign of an end to a crisis that has seen hundreds of businesses go bankrupt, millions of people thrown out of work and a once large middle class decimated. The IMF's managing director, Horst Koehler, said in a BBC interview before the Board's decision that there could be no guarantee that this new lending programme would work. He said there were risks, but he also said he believed President Nestor Kirchner could create a political consensus to implement the agreement. Their economy collapsed over a period of several weeks in late 2001 and early 2002. 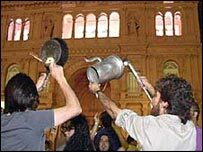 Argentines took to the streets in their thousands, bashing pots and pans, to demand action from their political leaders. Instead, former President Fernando de la Rua fled the presidential palace in a helicopter and shortly afterwards the country defaulted on its foreign debt of about $140bn - the biggest default in history. The government passed emergency laws to prevent people taking cash from their own bank accounts, in order to stem the flow of money from the country. Argentina devalued its currency, the peso, and ended its parity with the US dollar, a measure introduced 13 years previously in a successful battle against hyperinflation. A degree of stability returned. But thousands of businesses went under, unemployment levels shot up and there were reports of children dying of malnutrition. The devalued peso has helped boost Argentine exports and brought foreign tourists and investors flooding into what is now a much cheaper country. The economy is growing again, albeit slowly, and President Kirchner has overseen a return to a delicate political stability. But millions of Argentines are still finding it difficult to make ends meet. Tens of thousands have emigrated and many of those who remain have lost all faith in their political and economic leaders.